'So you wanna be a star' - 24 carat Disco gold from 1980 right here. 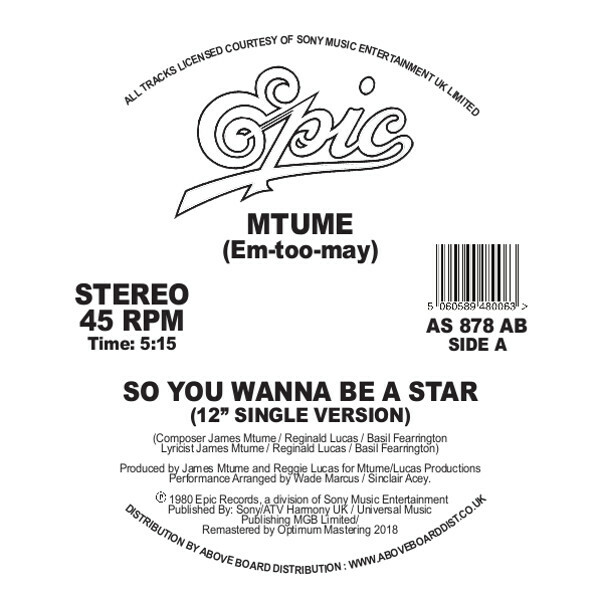 Mtume, led by legendary Jazz percussionist and all-round musical visionary James Mtume had a number of massive hits and can count quite a few 'classics' within their repertoire ('Juicy Fruit' anyone?). This flawlessly arranged, funk drenched jam speaks on the dangers of living life too fast and relying on those who can't be trusted. Remember, this was the beginning of the 1980's, the Disco era had began to fade amidst the drug hazed excesses of the previous decade, while the music continued forging it's path skyward with tremendous records like this one. 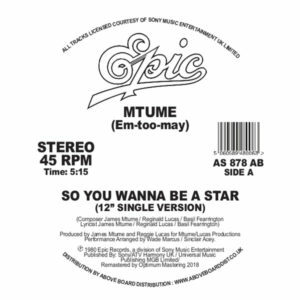 'So you wanna...' really has a message and that's not surprising considering it has one of the most underrated production teams behind it in the shape of Mtume / Lucas. A true gem of the post-Disco era. Essential and rare. This repress of the original Epic promo from 1980 is backed with a brand new re-edit from one of NYC's Disco kings - Mr.K aka Danny Krivit. With almost half a century spent behind the turntables in NYC and beyond he surely understands records like 'So you wanna be a star' intrinsically, he was, after all, there when it all happened! This classic has been legally reissued by Above Board distribution in conjunction with the legal rights holders - Sony Music Entertainment. This high quality repress features original Epic label Disco 12" artwork and has been remastered from Sony's original sources by Optimum Mastering, Bristol UK.